Only in NYC! How creative is this? 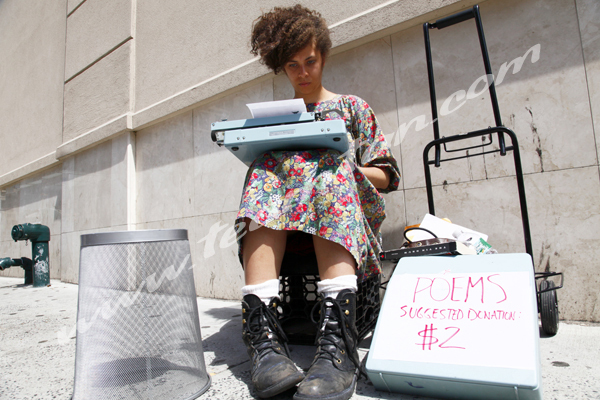 While walking back from lunch today around the Union Square area, my Department and I came upon this young lady, Anayvelyse, offering poems for $2. 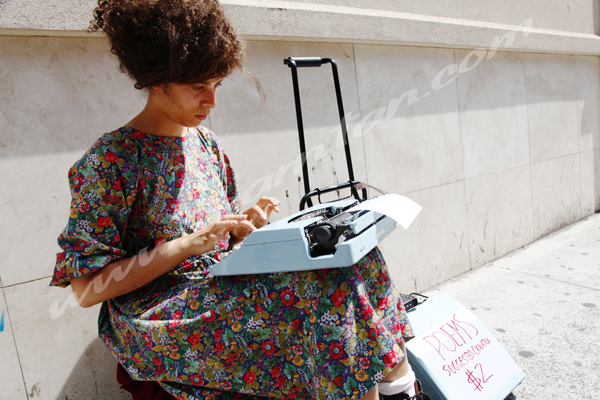 She literally would type out a poem for you right then and there from a typewriter. Seriously, where else could this happen?! The other day, I came across two young men sitting on their steps hand sewing a jacket! They looked very fashionable and the stitching they were doing on the jackets looked beautiful. I wish I had asked to take a photograph of them, but I didn’t. Damn it Tear-n! I wonder if this will be the summer of extreme creativity and self-creation. It’s like the rebirth of the Lost Generation, Bateau Lavoir, Montparnasse, everything I adore about the 1920s! Maybe 2010 will be the start of another Lost Generation era.